Coffee is one of the most consumed drink by Americans and most of the homes there are equipped with an auto drip coffee maker. The reason behind the love to these brewers are speed, convenience, and portability over the other coffee machines. Moreover, these are generally economic to buy and maintain. It’s time to get a coffee maker at home if you are pissed by absurd prices of cafes and the huge time they take to serve the drinks. A drip coffeemaker can cost as low as $25 and can go as high as $400. Obviously, the lowest cost will be just a basic machine that outputs brown hot water. We suggest to buy a coffee maker, that brews consistently at right temperature – It’s a basic concept applicable if you are a serious coffee drinker. Do you know why a French Press is still praised? It’s because we have full control over the temperature and timings for brewing. Here are briefings about few of the best drip coffee makers that are loved all over and pack some of the awesome features. We suggest you to study all units below and than collate your requirements with selected products. Below is a video by Folger’s on how to brew using a drip coffee machine. Consider watching it if you are buying a coffee maker for the first time. Do you have that one coffee connoisseur friend who insists that only pour-over coffee is worth drinking? If you are a coffee snob but prefer the convenience of an auto drip, this machine has it all. A microprocessor-controlled brew cycle imitates the stop-and-start of manual pour-over brewing. It’s also a beautifully designed piece of equipment that will look great in your kitchen. The OXO On has been neglected by many reviewers, but it brews the tastiest coffee with all the looks of a beautiful machine. 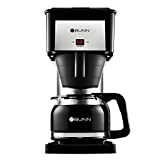 You won’t be disappointed by Oxo at any point and that’s why we have considered this machine at the top of our Automatic Drip Coffee Makers. OXO On 9 Cup can be easily sad as the best home coffee brewer above all. Though it’s the second most costly in our list, for sure it does all the precise work with perfection. Also, it has the least negative reviews among others and that is what actually says all. Hence, buy this one for complete peace of mind and awesome technology that brews consistent coffee every time. Breville, with a lot of fame in semi-automatic espresso machines has recently launched its Precision brewer. It’s a rival to many of the old competitors like Technivorm Moccamaster and Oxo. The Breville brewer is tad fresh and modern in looks. It also has fine tuning options that controls many parameters of brewing. If you are really a fan of regular coffee, and can spare this much amount, then Breville Precision brewer is waiting for you. For sure, you will be amazed after trying coffee with the Gold brew setting. This smart companion even adjusts water temperature and brew time accordingly for the set quantity. We can even change the filter with a Chemex coffee maker or a Pour over (Hario V60) with the already provided adapter to make coffee our way. All in all, it’s a great brewer to add to your kitchen. Here we have a beautiful creation by Bonavita and it’s been serving for long as former model BV1800. The brand has recently updated the product and it’s now known as BV1900TS. The whole focus of this product is to optimize the brew quality of coffee without introducing much of functionality. Bonavita is among the very reputed names in making quality coffee makers and BV1900TS is one of the best in the whole compilation. Its powerful heating system maintains a stable water temperature between 195 – 205 Fahrenheit allowing proper extraction of flavors. Many other units claim to have this temperature band, but it’s not consistent in most. The unique showerhead design evenly spreads hot water over the coffee grounds and is one of the unique features of this coffee machine. Bonavita is one of the best tasting coffee maker available in the market with a feasible price tag. If you don’t have the budget of Moccamaster or the OXO, this one can be the best pick for you. Moccamaster, hope you might already have heard this name. We simply can’t miss Technivorm Moccamaster, when we are talking about the top coffee makers. These machines might be a costly affair but the word ‘Perfection’, is embossed here. Moccamaster’s are the product of Netherlands and are solely built for the quality brewing of coffee, that is perfect for all attributes. Every aspect that matters for the perfect tasting coffee cup ( like temperature, speed, and pressure) are all controlled in a precise manner. Technivorm is SCAA certified and you might not find anyone disappointed with it. Moccamasters by Technivorm are specially made to do one thing, that is ‘brew perfect coffee’. Rather than fancy controls, this piece is just made with 2 controls: the on/off switch and the manual slider on the brew basket to adjust the drip rate. There is one more control for brew speed where one can choose full drip, half drip or no drip. The brew time is merely 4-5 minutes for optimum taste. Moreover, this piece of perfection comes with a thermal insulated pot to keep your perfect coffee hot for a longer span. If you have some spare money to spend and desire to owe among the top rated coffee makers, this might be the one you are looking for. Along with SCAA, it is also SCAE certified. We might have considered this as the best and placed it at the top but the pricing part is on the higher side as compared to the others. This machine is even more minimalist in design than the Bonavita. The name says it all, ‘Velocity’ means it brews coffee too fast. 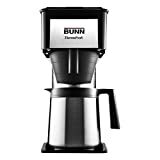 Bunn has been making commercial coffee makers for decades, and their experience is reflected in the robustness of this model. It has no programmable features (not even a button to start brewing!) but brews very rapidly at a perfect temperature every time. The spray head turbulence guarantees optimal coverage for a great tasting brew. Anyone who has used this machine before won’t be going anywhere else and that’s why it’s included in our best of drip coffee brewers list. Last but not least is a machine that uses cutting-edge technology in an innovative way to imitate a very low-tech brewing style. Braun has recently launched an amazingly crafted brewer that looks both elegant and modern, with its intuitive controls. The operation is easy and is understandable in one go. It’s PureFlavor system brews just at right temperature. Below are some of the features you must know before buying one. This coffee maker is priced for every budget. It’s neither too low and nor much expensive, and fits well if someone is serious about coffee. It has simpler controls and is made to give just great cup of coffee – nothing fancy about it. This American-made coffee maker just squeaks in under $100, making it the most expensive model reviewed here. As its name suggests, this is the perfect coffee maker for people who don’t like waiting for their morning coffee fix. A reservoir keeps water hot and ready for brewing all the time, which allows the fast brewing time as well as ensuring an optimal brewing temperature. The Velocity Brew uses a flat-bottom basket filter for better filtration. The model is long lasting and is considered as the reputed one from Bunn. If you don’t care about bells and whistles, but just want a solid, reliable machine that makes great-tasting coffee, than this model by Zojirushi is for you. Note that 5 cups is about the same as 2 mugs, so this isn’t a good choice for a family of coffee-drinkers. This machine uses cone filters, which many people feel is best for maximizing flavor. The Zutto has no timers or automatic shut-off. One nice feature is the detachable reservoir that you can carry to the sink for filling. Otherwise, this coffee maker is all about the end product. The price of this model has gone up in with time and is one of the most successful model in brewing list. The Brew Central has enough bells and whistles to keep most people happy. You can program everything from the automatic shut-off to the brew start time. It has a 1-4 cup option, adjustable brew strength, a self-clean setting and adjustable temperature for the carafe warmer. Oh, and it makes great coffee too! This coffee maker can be found in many households due to its feasible price range and a host of features. Cuisinart has a good reputation for making many household appliances and also few of the very best coffee machines. This model is a great choice if you’re tired of your coffee maker serving up a lukewarm brew that requires having microwave before drinking. The piping hot brew temperature and cone filter ensure that your coffee will always taste great. This machine is fully programmable, so you can wake up to freshly brewed coffee. The model is more practical as it arrived after the older model Cuisinart 1200: more flavorful coffee, optimal brewing process, large capacity and a bigger water inlet for water filling. 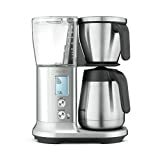 Cuisinart DCC3200 is one among the top rated drip coffee machines for its combination of price tag and features. The next coffeemaker combines programmability with the option of grinding your own coffee right before you brew it. Nine times out of ten you might only want to brew a single cup of Joe, but you may also want to have the option of brewing a full pot while having guests. 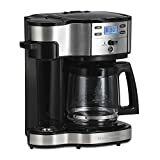 For these situations, the Hamilton Beach 49980A is the best 2 way coffee maker as it makes perfect cups all the time and is economic too. It brews into a 12-cup glass carafe like a regular coffee machine but also allows you to brew directly into a single serve insulated travel mug keeping in mind of your travel habits. So, it’s a regular coffee maker as well as a one cup coffeemaker too. Though it costs on the higher side than the above coffee makers but ensures to last long with its great features. If you are a big mug drinker, then just don’t worry, it brews up to 14 ounces in the travel mug and can adjust shorter if you want. Single-serve side brew basket comes with a mesh filter to hold ground coffee or pre-packaged soft pods. One point to note here is that the Travel Mug is not provided in the package and it has to be bought separately. But still, the machine is worth the package. 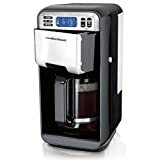 At number 3 in the list of Best Coffee Makers under $100 is Cuisinart Coffee Plus. This is another model that uses a hot-water reservoir to ensures the perfect temperature for brewing which is an essential aspect to look for before buying a coffee maker. The Cuisinart Coffee Plus has a lot of great features, including a 24-hour timer that lets you wake up to fresh coffee. 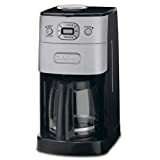 At a capacity of 12 cups, this coffee maker is suitable for a household of coffee lovers or in the small sized office staff room. As an added bonus, the hot water in the reservoir can also be used to make tea and other hot beverages. A charcoal filter purifies your water before brewing so that is again a good addon with this price tag. Who wouldn’t want to wake up to freshly ground and brewed coffee? The grinder takes the guesswork out of grinding, as it is set to the optimal grind to brew with this machine. You can also bypass this function if you want to use your own pre-ground coffee. Unlike some grind-and-brew machines, this model is easy to keep and clean. The DGB-650BC is the improved version of the older DGB-600 and hence has many flaws covered up. If you are looking for these type, then we would suggest you to read more about Coffee maker with grinder. There are more models to compare as per your needs. Cuisinart has been doing wonderful jobs by providing great drip coffee makers under feasible prices. Pick any from this brand and you won’t be disappointed for your basic coffee needs. No more worrying about replacing a broken carafe – this machine dispenses with the carafe altogether. Instead, it brews into an internal tank which gently heats the coffee and keeps it warm for hours without scorching. Dispense it directly into serving mugs at the press of a button. This coffee maker also has a function for making iced coffee. It has all BPA parts which come in contact with water and coffee. The parts of this coffee maker are dishwasher safe making it easier to clean. Hamilton 48464 is one of the highest selling drip coffee brewers in the market and comes with a very feasible price tag. This machine works well if you’re the only coffee drinker at your house. It’s a Single Cup Coffee Maker in which you can easily brew a serving into the included travel mug on your way out the door every morning. With its easy-to-clean reusable filter, this model is an affordable and environmentally friendly option for brewing single servings. It almost offers many of the benefits of pod brewing systems without any of the drawbacks. Finally, this one is basically for those who are in rush every morning. Just brew in the provided thermal mug and move away with it. Drink your coffee on the way! Either when you have a tiny kitchen, or when you only want to make coffee for one or two people, this Mr. Coffee model is perfect. It makes up to four 5-ounce cups of coffee making a total of 20 oz, which for most of us translates to two normal-sized servings. Most of all, this machine may be small, but it’s fully programmable so you can wake up to fresh coffee. It has removable filter basket for easy cleaning and also has a pause function which lets you take a pause while brewing to serve a cup in between. Just be warned that the clock doesn’t always keep perfect time! So, it’s not the best coffee maker out there, but it’s reasonably priced and makes a decent cup of Joe every time. Maybe this is not the fastest machine out there, but if you’re looking for something affordable, attractive and programmable that makes excellent coffee at the right temperature, it’s a good choice. The model comes with under $60 price tag. It is designed to be easy to use and clean, and it gives you a plenty of options. You can set it to brew 1-4 cups if you don’t want a full pot, and you can choose between two brewing strengths. The reviews of this model simply point that this model brews an excellent cup of coffee. 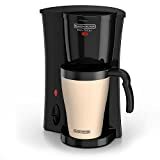 The reason for including this coffee maker in this list is the combination of affordable price with great tasting coffee. The coffee is also not very hot as it should be. Whether you consider making coffee a daily chore or a gratifying ritual, there is no denying that drinking a hot cup of coffee is a pleasurable experience that prepares us for a hectic day ahead. If you want to enjoy a great everyday cup of coffee with a bold flavor, there is no better option than a drip coffee maker. If you want to leave mediocre coffee behind and start drinking superb drip coffee, first you must find the right brand that fits your needs. That being said, you must also know about types of drip coffee makers before buying one for yourself. Even though there is the use of same brewing technique in all drip coffee makers, it is important for you to buy the one that comes with some extra features and settings. Therefore, you need to choose the right carafe that suits your requirements. It is recommended to buy a drip coffee maker that comes with the feature of precise temperature control. This feature ensures the water is heat up to optimum temperatures as it helps roast the coffee to its flavorful potential. There are many coffee makers that face the issue of temperature fluctuations that can affect the aroma, acidity,and flavor of the coffee. Therefore, it is best to invest in a coffee maker with no temperature fluctuations. Thermal Carafe – These are highly recommended to people who do not like making coffee every now and then. A thermal carafe not only brews a big pot of coffee but also keeps it hot and flavorful for several hours. And the pot is sturdy and portable – making it perfect for families and offices. Given that the carafe is insulated, there is no need to place your coffee on a hotplate to keep it warm. This helps in averting the coffee from overcooking or burning and ensuring that there is no compromise on taste. Hot Plate – The glass carafe drip coffee maker cannot stay warm for too long because it is not insulated. Since the coffee remains only warm when the carafe sits on a hotplate, it is best for people who do not consume too much coffee. It is because the flavor and taste are compromised as a result of keeping the coffee on a hotplate for too long. If you really want to go with this, it is best to choose a glass carafe machine that is equipped with the feature of temperature or timing mechanism that enables the user to control the temperature of the hotplate or set timing for the hotplate to turn off. However, with a glass carafe, you can actually see the whole brewing process. While choosing a drip coffee maker, one of the most important factors to consider is the serving size. It is because if everyone in your house loves to kick-start their day with coffee then it is not the best choice to buy a drip coffee maker with a serving size of 4. Depending on the daily consumption of coffee in your house, you can buy the one with a serving size of 14 or more. 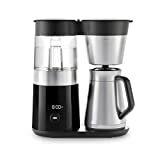 If you are the only person in your house that is addicted to coffee and cannot live without it, then it is best to purchase a drip coffee maker that is specifically designed to brew small pots. And also make sure that the coffee maker enables you to regulate the speed of water flow over the coffee grounds. A coffee maker that enables the user to adjust the flow is definitelythe best choice. It is because if the flow is not adjusted, the extraction time is limited and the flavor gets damaged. So, make sure you consider this important point before investing in a drip coffee maker. There are machines that do not come with temperature control feature. Make sure you buy a drip coffee maker that boasts a steady temperature control of 195°F to 205°F. A machine with steady temperature control makes sure your coffee isn’t too cold or too hot. If you are in the league of those people who loves coffee but absolutely hates cleaning their coffee makers, you are still going to experience some trouble here. From washing removable parts of daily use to decalcifying your machine every month, the whole cleaning process is not something to be afraid of. There are machines that enable the user to pre-set the time for the brewing process to commence. It provides the convenience to the user as the machine does all the work and coffee is prepared at the set time. It is best to look for a machine that comes with more features. Machines with more features tend to be expensive but then again, you’ll get convenience and quality. For instance, there are machines with built-in coffee grinders that make a great, freshly brewed coffee that is unquestionably more divine than pre-ground coffee. Look for a brewer that can be automatically shut off after a certain amount of time. This feature can become handy if you’re a type of person who forgets to turn the coffee maker off every now and then. In addition, this feature saves the electricity bill as well. Drip coffee makers with glass carafes are not even close to thermal carafes when it comes to durability. If you are not good with breakable objects, you need to invest in a drip coffee maker with a thermal carafe. Simply look for a brand that is reliable, affordable, and covers all the basics. You can get a drip coffee maker under the price of $100 and you can also get one that is over $500. However, with the extraprice, it is guaranteed that you will get to enjoy more features and quality. A drip coffee maker is just perfect for families, offices, and people who like to invite friends and colleagues to their home. Finding the best one is not a difficult process if you look for features rather than price. Depending on your needs, you can buy it in different brew sizes that range from 4 to 20 cups. However, if you are the only person in your home that drinks coffee, it is best to buy a drip coffee maker that has a capacity of brewing 10-14 cups of heavenly coffee. While buying a drip coffee maker, look for programmable features such as temperature control and auto shut off. Now that you’ve read about the best coffee makers in the auto drip category, it’s time to decide which one is suitable for you. Hamilton Beach, Cuisinart and Mr Coffee are straight to use machines that don’t require much know how whereas if you are a passionate coffee drinker and want to bring brew quality to perfection – Oxo, Bonavita, Technivorm, Breville and Braun might be your best companions.